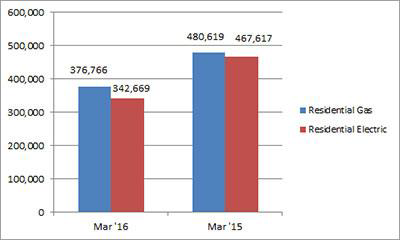 U.S. shipments of residential gas storage water heaters for March 2016 decreased 21.6 percent to 376,766 units, down from 480,619 units shipped in March 2015. 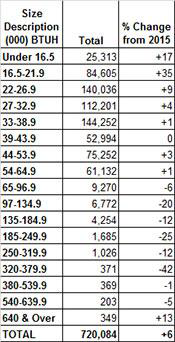 Residential electric storage water heater shipments decreased 26.7 percent in March 2016 to 342,669 units, down from 467,617 units shipped in March 2015. For the year-to-date, U.S. shipments of residential gas storage water heaters decreased 15.3 percent to 1,083,761, compared to 1,278,975 units shipped during the same period in 2015. 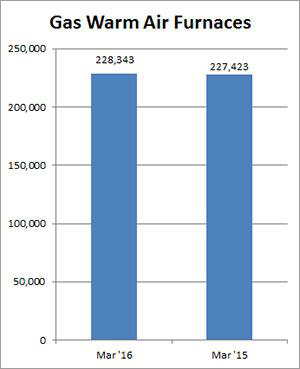 Residential electric storage water heater shipments decreased 22.6 percent year-to-date to 998,372 units, compared to 1,290,055 units shipped during the same period in 2015. 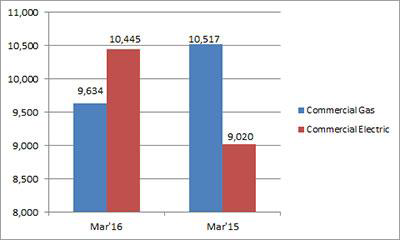 Commercial gas storage water heater shipments decreased 8.4 percent in March 2016 to 9,634 units, down from 10,517 units shipped in March 2015. Commercial electric storage water heater shipments increased 15.8 percent in March 2016 to 10,445 units, up from 9,020 units shipped in March 2015. Year-to-date U.S. shipments of commercial gas storage water heaters decreased 8.6 percent to 25,421 units, compared with 27,820 units shipped during the same period in 2015. Year-to-date commercial electric storage water heater shipments increased 23.4 percent to 26,810 units, up from 21,725 units shipped during the same period in 2015. U.S. shipments of gas warm air furnaces for March 2016 increased 0.4 percent to 228,343 units, up from 227,423 units shipped in March 2015. 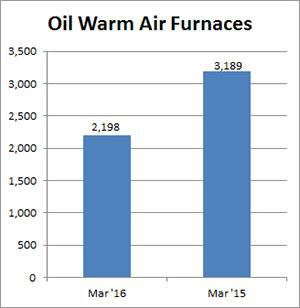 Oil warm air furnace shipments decreased 31.1 percent to 2,198 units in March 2016, down from 3,189 units shipped in March 2015. Year-to-date U.S. shipments of gas warm air furnaces increased 3.1 percent to 616,990 units, compared with 598,487 units shipped during the same period in 2015. Year-to-date U.S. shipments of oil warm air furnaces decreased 5.7 percent to 8,086, compared with 8,574 units shipped during the same period in 2015. U.S. shipments of central air conditioners and air-source heat pumps totaled 720,084 units in March 2016, up 6.5 percent from 676,010 units shipped in March 2015. 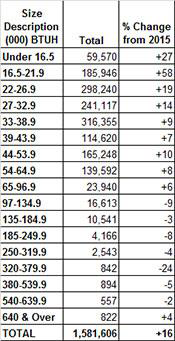 U.S. shipments of air conditioners increased 6.9 percent to 467,666 units, up from 437,339 units shipped in March 2015. U.S. shipments of air-source heat pumps increased 5.8 percent to 252,418 units, up from 238,671 units shipped in March 2015. 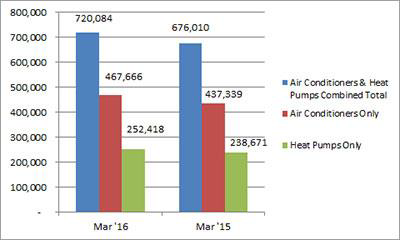 Year-to-date combined shipments of central air conditioners and air-source heat pumps decreased 3.1 percent to 1,581,606 units, down from 1,631,423 units shipped in March 2015. Year-to-date shipments of central air conditioners decreased 2.0 percent to 1,000,663 units, down from 1,021,179 units shipped during the same period in 2015. The year-to-date total for heat pump shipments decreased 4.8 percent to 580,943 units, down from 610,244 units shipped during the same period in 2015.